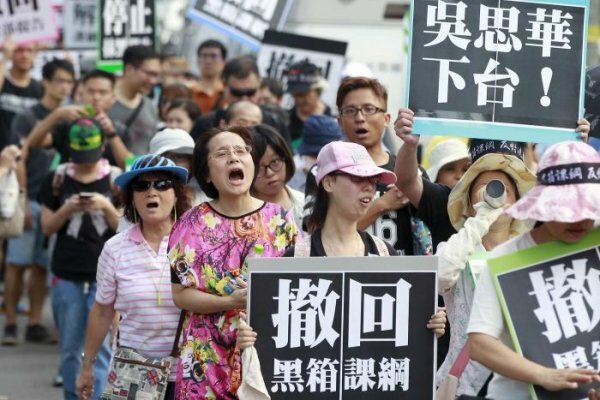 On 31 July 2015, hundreds of Taiwanese citizens took over the streets to demonstrate against the upcoming distribution of school textbooks, which they claim have been revised in line with the “One China” perspective. Protestors fear further brainwashing within the classrooms and argue that the revision process lacked transparency. The Minister of Education, Wu Se-Hwa, acknowledged that the new text has controversial points, but argued that teachers will have the freedom to choose how much of the content will be used. The protests reflect a rise in nationalist sentiment among Taiwan's youth, whose generation is more prone to Taiwanese self-identification than to Chinese. More than 100 youths stormed Taiwan's ministry of education on Friday in a bid to repeal changes to history books likely to hit school shelves this week. Dozens were still camped out in the building's courtyard on Monday (local time). Last month, dozens were arrested for scaling ladders and breaking into the building. One later took their own life, though the motivation was unclear. The protests, the largest in over a year, reflect a surge of nationalism among Taiwan's youth, who are far more likely than their elders to identify as Taiwanese rather than Chinese. They also come ahead of January elections in which the youth movement will likely help sweep in a party which leans towards independence from China, something Communist Party rulers in Beijing will never condone, even though the island is self ruled. "We are Taiwan. China is China," Liu Tzuhao, 18, said in front of a makeshift memorial to the suicide victim at the protest site. China has since viewed Taiwan, which goes under the official name of Republic of China, as a renegade province and has not ruled out the use of force to bring it under its control. "We are Taiwanese and should study Taiwan's history," 17-year-old Keanu Hsu declared during a forum hosted by the ministry before school begins at the end of August. When ministry officials at the forum light-heartedly asked the students what name could replace Republic of China, they shouted "Taiwan" in response. History teacher Chang Wen Lung said the textbooks warped historical episodes such as agreements establishing Republic of China sovereignty over Taiwan after World War II and denigrated the influence of Japan, the island's colonial ruler for decades prior and traditional foe of Beijing. The protests echo last year's Sunflower Movement, in which thousands of young people occupied parliament for weeks to oppose growing economic ties with China. They also reflect the same fears about Beijing's "one country, two systems" formula under which Hong Kong, a former British colony, returned to Chinese rule in 1997 and which Beijing aims to impose upon Taiwan. Months of pro-democracy protests on Hong Kong streets last year threw that formula under a harsh light and became a huge embarrassment for Beijing. The ministry has called for dialogue and the two sides are expected to meet later in the day, though hopes for a breakthrough are not high. One student threw a rubber sandal at education minister Wu Se-Hwa on Friday when he emerged to address them. Over the weekend the ministry website was inaccessible after a suspected hacking. "We understand there's controversy behind the textbooks," Mr Wu told Reuters in a recent interview. "We hope it can contribute to positive discourse in the classroom rather than on the street." Mr Wu said teachers could choose how much of the revised books should be used and said that points of controversy would not be part of national examinations. Such concessions have yet to appease opponents, who say the revision process lacked transparency and the committee was stacked with unification advocates under China-friendly president Ma Ying-jeou, who has overseen a number of trade deals with the mainland. "It's ridiculous," said protester Peng Cheng, 18. "One country cannot have two kinds of history."